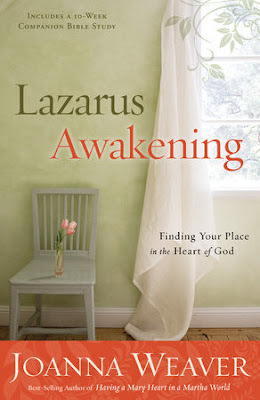 Disclosure: I received Lazarus Awakening by Joanna Weaver complimentary from Blogging For Books. Provided that I give an honest review. Lazarus Awakening is about having faith and trust in the Lord, and is about the story of Mary, Martha, and Lazarus, where Jesus came and resurrected him from the dead. The author does touch on a lot about how many people believe that God loves them and can tell others that he loves them. The issue is deep down, they still have a doubt, because it is hard for them to fully believe anyone, even God can love them. She explains how we need to get those doubts out of our head. Weaver also explains some ways folks use to get through those doubts. I hate to admit it, but I am one of those folks. It is hard for me to believe that anyone can love me. I just have to keep telling myself that I can be loved. God loves me and he loves everyone. In each chapter Weaver slowly goes through a few verses at a time, incorporating her life experiences and excerpts from other books. The author also included a 10 week companion bible study in the back of the book, along with a bonus chapter and tools and resources. I will admit she did share some points I need to work on, and next time I will use the study guide in the back when I reread it. I didn't want to use it the first time I read it, because I just wanted to focus on reading the book first. I cannot wait to go back and reread the book with the bible study. I will also make sure to look up all the verses she shares in her book. It is worth a read if you enjoy Bible study books. There is also a set you can buy that comes with the DVD and the other Bible study book. Lazarus Awakening would be a great book for a group study. If you are interested in purchasing this book you can find it HERE. Have a Blessed Day! ABOUT THE AUTHOR: Joanna Weaver is the best-selling author of Having a Mary Heart in a Martha World, Having a Mary Spirit, Lazarus Awakening, and the award-winning gift book With This Ring. Her articles have appeared in such publications as Focus on the Family, Guideposts, and HomeLife. Joanna and her pastor-husband, John, have three children and live in Montana. Visit her website at www.JoannaWeaverBooks.com.